Yaolong Chen and coworkers analyse the situation and challenges for clinical practice guidelines in China and provide recommendations for their development and implementation. Clinical practice guidelines are statements that include recommendations for the optimisation of patient care. They are informed by a systematic review of evidence and an assessment of the benefits and harms of alternative options.1 Such guidelines are an extremely important tool for healthcare delivery in China. Firstly, implementation of cost effective treatment and care will help to optimise resource use and patient outcomes for the country with the largest population in the world. Secondly, substantial variability in clinical practice exists among hospitals and in different districts across China, which can be minimised by the use of guidelines. Thirdly, China is the only country where Western medicine and traditional Chinese medicine are practised alongside each other at every level of the healthcare system; traditional Chinese treatments account for about 40% of the total.2 Healthcare providers can use guidelines to identify and apply evidence based recommendations across both types of medicine in a complementary and safe manner. We analyse the situation and challenges for clinical practice guidelines in China and provide recommendations for their development and implementation. Given the low quality of Chinese guidelines and the limited resources available, China needs to be strategic and pragmatic in developing new guidelines, and carefully prioritise its population’s needs. The adoption or adaptation of existing high quality international guidelines is a potentially efficient and cost effective approach (see box 1). International guidelines also have limitations, however: they may have methodological flaws, and different guidelines for the same topic may have inconsistent recommendations. Some factors that are relevant to China may be neglected, such as traditional Chinese medicine. Even if the recommendations are credible, consistent, and relevant, some critical factors remain that must be considered before they are implemented. In many cases, therefore, China needs to develop guidelines de novo to meet the needs of its populations (see box 2). Based on the above discussions of guidelines in China, we propose the following recommendations to improve their quality and implementation. Chinese guideline developers should comprehensively review existing national and international guidelines before starting new guidelines. Once relevant guidelines are identified, developers should evaluate their quality, analyse included recommendations, and assess the evidence that supports each recommendation. 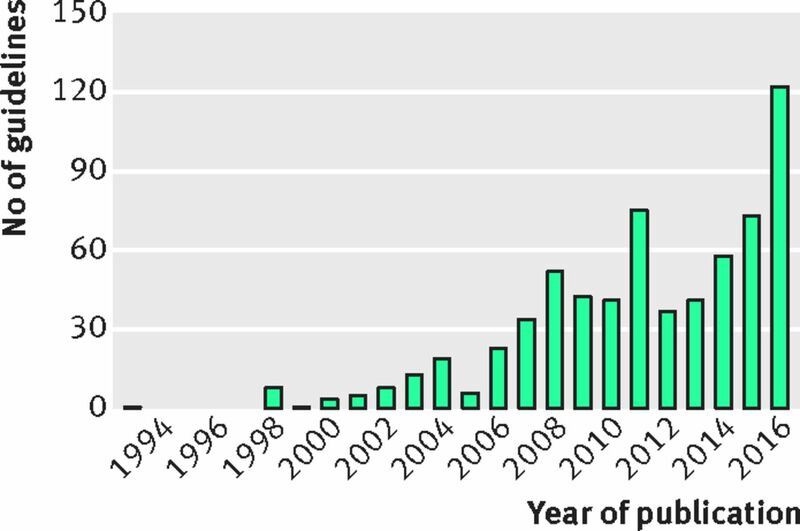 To avoid unnecessary primary research, no new studies should be done without a systematic review of existing evidence.32 Similarly for clinical practice guidelines, developers need to survey what has already been published. To facilitate this, the Guidelines International Network (G-I-N) database lists more than 6300 guidelines (http://www.g-i-n.net/library) and the US National Guideline Clearinghouse contains over 1600 (https://www.guideline.gov/browse/clinical-specialty). Chinese guideline developers and methodologists should work together on guideline development and also on guideline methods and implementation research. Chinese researchers have published a number of guidelines and methodological papers in international medical journals. For example, they are taking a lead role in research on the reporting quality of guidelines and have developed a tool—RIGHT (Reporting Items for Practice Guidelines in Healthcare) checklist.34 They are also focusing on registration of practice guidelines, managing a multilingual international practice guidelines registration platform (IPGRP).35 As does the international clinical trials registry platform (ICTRP) and the international platform of prospective registrations of systematic reviews (PROSPERO), the IPGRP aims to improve transparency in guideline development and prevent duplication, as well as promote the collaboration, dissemination, and implementation of guidelines. In addition, Chinese guideline developers and methodologists can make major contributions to Chinese medical research as they highlight priorities and unanswered clinical questions in the section on research gaps that should be part of all clinical practice guidelines. Chinese guideline developers and policy makers should establish a national system to collect, disseminate, and implement guidelines, strengthen the management of conflict of interest, and provide quality assurance and control. Several newly formed institutions and collaborations are working to deal with these matters. For example, the National Health and Family Planning Commission of China opened a new agency in 2015: the National Center for Medical Service Administration. One of its key functions is to provide quality assurance and promote the use of guidelines. An ongoing programme of the agency is to build the China National Guideline Clearinghouse in collaboration with the WHO Collaborating Centre for Guideline Implementation and Knowledge Translation. Chinese clinicians and patients will have free access to this searchable database. Chinese guideline developers and methodologists should enhance communication and cooperation with international guideline and evidence based healthcare organisations. For example, Cochrane China was established in 1999 and the Chinese GRADE (Grading of Recommendations Assessment, Development and Evaluation) Centre in 2011. These two centres are each part of an international network, and provide methodological training and produce systematic reviews to support the adaptation and development of guidelines in China. G-I-N Asia, cofounded by China, Japan, Korea, and Singapore in 2016, aims to lead, strengthen, and support collaboration across Asia. In conclusion, the successful development, adaptation, and implementation of clinical practice guidelines in China depends on many factors, including the existence of high quality, relevant primary research studies from China; robust methods; efficient processes; adequate resources; quality assurance; widespread dissemination; implementation in health systems and by healthcare providers; and appropriate monitoring and feedback for quality improvement. Efforts are well underway to deal with all these factors and significant progress has been made. Trustworthy guidelines are an invaluable tool for helping Chinese patients and clinicians prevent and manage disease. We thank Janne Estill for his comments and revisions on an earlier draft of this manuscript. Contributors and sources: YC conceived the idea and drafted the paper. All authors contributed to the paper and perspectives, and agreed with its final content. YC is the guarantor. Competing interests: We have read and understood BMJ policy on declaration of interests and declare the following interests: YC and SLN are members of GRADE working group. YC and KY are supported by National Natural Science Foundation of China (grant No 81503459, 81673825) and the open fund of the Key Laboratory of Evidence Based Medicine and Knowledge Translation of Gansu Province (grant No EBM 1701) to conduct methodological research on clinical guideline development.
. An analysis of the citation of clinical practice guidelines in China. Chin J Evid Based Pediatr2013;8:467-70. doi:doi:10.3969/j.issn.1673-5501.2013.06.013. Wang T, Wang C, Wang X, et al. A survey of chinese panelists involved in the development of practice guidelines. The 7th Asia-Pacific Conference on Evidence-Based Medicine, Urumqi, 2012.
. Adherence to treatment recommendations of gout: a patient survey in China. Arthritis Rheumatol2014;66:S76-7.
. Development of the HIV/AIDS clinical nursing practice guidelines.Fudan University, 2014.
. Structure of potential population related to family planning policy and willingness to have second child—analysis of results from two large-scale surveys. Journal of Jiangsu Administration Institute2015;6:54-61. doi:doi:10.3969/j.issn.1009-8860.2015.06.00.
. The British Society for Rheumatology guideline for the management of gout. Rheumatology (Oxford)2017;56:e1-20.
. Evidence-based guideline of clinical practice with acupuncture and moxibustion: simple obesity.China Press of Traditional Chinese Medicine, 2014.
. Essential methods and procedures on how to develop and update clinical practice guidelines. Natl Med J China2016;96:250-3. doi:doi:10.3760/cma.j.issn.0376-2491.2016.04.004. Chen Y, Wang M, Wang Q, et al. The development of an international practice guidelines registry platform. G-I-N 2016 conference, Philadelphia, 27-30 September 2016.